Wondering what to pack for the Galapagos? You’re not alone. 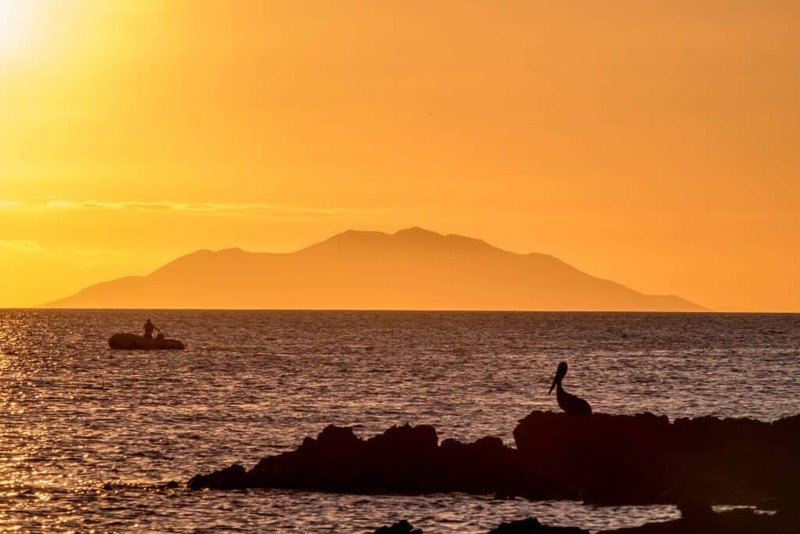 The Galapagos are a place unlike any other on earth. They are quite the trip from mainland Ecuador, and tough to get to for most. Because of this, it may be hard to find a reliable Galapagos packing list. We just had the most incredible time on our Galapagos Cruise, but honestly didn’t know what to pack for the trip. Hopefully, this list will make your trip to the stunning islands just a bit easier when planning. You’re going to the Galapagos and will be surrounded by water. Don’t forget at least two pairs of bathing suits. It’s always nice to be able to swap between instead of getting into a wetsuit from the day before. My favorite bathing suits for both men and women are prAna. They are supportive and make truly great eco-friendly products. If you’ll be doing any snorkeling you may want to have a wetsuit. Most operators will provide you with a wetsuit for a charge, but if you have a wetsuit and space you may want to pack your own. We personally snorkeled three times in the Galapagos in June. Each time we opted out of a wetsuit, and while the water was chilly it wasn’t freezing. Light, comfortable, and loose clothing is great for active trips like these. You’ll be staying active walking around under the sun. There’s nothing that I hate more than having skin tight clothes on in the middle of a hot day. 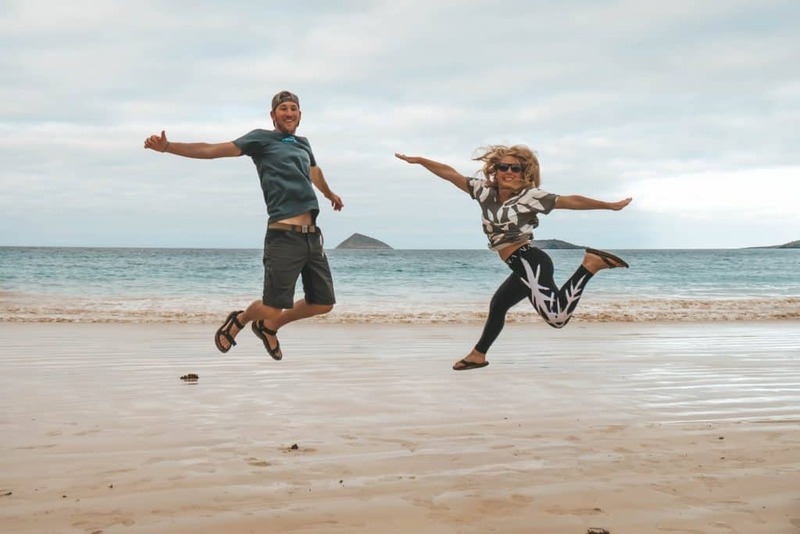 We traveled with prAna hemp pants and for women, I would suggest the steph joggers. They are light and so comfortable! I always travel with a rain jacket just in case. If you are traveling the Galapagos in the wet season (December to May), a rain jacket is essential. While the weather mainly stays mild in the Galapagos the hot Panama currents, and the Northeast trade winds can cause it to rain around the islands. Rain is typically short-lived, but you won’t want to get soaked during that time. I have this one from Kathmandu and it has kept me dry for years. It gets chilly at night in the Galapagos. I was really happy I packed a hoodie to keep me warm while outside. While most of our trip was spent checking out different islands we did have a little down time for the beach. A beach cover-up or sarong is never a bad idea to take on any trip. Most of my cover-ups come from Pitusa. Pitusa only uses Peruvian and Indian cotton and employs women from Peru, Bali, and India to make the products. As a fan of fair trade, I love that these are made in ethical work environments. These Pitusa dresses are also so beautiful they double as a night out dress (but are sheer so wear something underneath). There’s a lot of little critters around the islands, and you’ll be walking around the islands exploring almost every day of your trip. For trips like this is I would recommend the ExOfficio Breez’R Shirt. It’s 100% nylon and has “Insect Shield” technology repelling all those creepy crawlers (and mosquitos!) We traveled all over Africa on safari with them and avoided many bites. 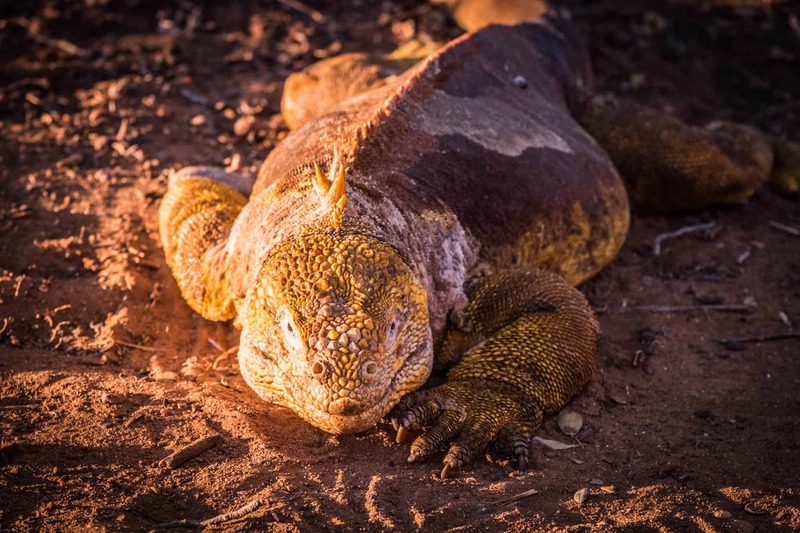 There will be downtime while you’re checking out the Galapagos so make sure you are comfy. A pair of flip flops for walking around at your leisure never hurts either. You’re at the equator so you will 100% need sunscreen in the Galapagos. Most hotels and ships won’t provide this and will charge a premium to purchase on the islands so make sure to bring yours from home. We personally choose eco-friendly sunscreen when we are going into the ocean so that we don’t release chemicals into the environment. This is the exact kind we traveledwith to the Galapagos and never got burned. Don’t skimp on the sunscreen for the sake of a tan! Even the locals slather it all over their body here. You’ll be exploring and walking around some pretty amazing wildlife destinations here, but that also means there will be bugs. Bring a small tube of bug spray to protect yourself. If I could go back in time and redo my Galapagos packing list I would have 100% thrown a dry bag in. I didn’t think about it before we got to Ecuador, but once we boarded the ship I realized how nice it would have been to stick my valuables and electronics in a dry bag while on the dingy between islands. You’re surrounded by water at almost all times and a dry bag will definitely help you protect your valuables especially when traveling between islands. 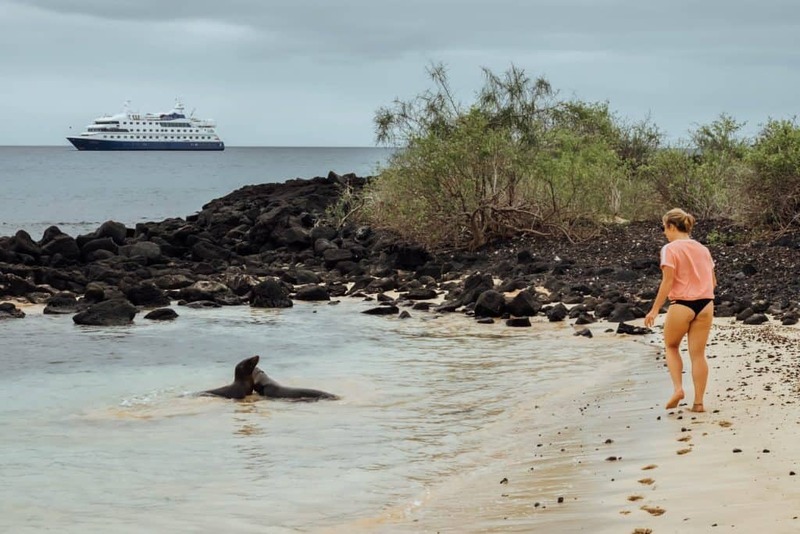 Since your main home while in the Galapagos will most likely be on a ship or on Santa Cruz island you will be packing up every day to explore from your base. A backpack to throw all your necessities in is also an essential item for the Galapagos. Here’s a review of all of our favorites. Remember what I said about the equator? There’s gonna be a lot of sun in the Galapagos and a hat will help protect your face and eyes from it. Bring a baseball cap or sun hat from home. Or you can purchase Ecuador’s famous Panama Hats just about anywhere in the country! (Including the airport, they are everywhere!) Hint Don’t roll your Panama Hat into your suitcase, I made that mistake and now it is ruined after only wearing a few times. Instead wear your hat on the plane when you travel. Sun+equator. I know I sound like a broken record, but I don’t want you to hurt your eyes! The Galapagos guides I spoke to recommend good quality sunglasses with UV protectionin the Galapagos since the sun is so strong and often bounces off the water. A good pair of walking shoes is essential for touring the islands. I personally traveled to the Galapagos with my Hoka Ones Ones Speedgoat 2, and they were perfect. Check out more of my favorite travel shoes here. Both Cameron and I – and just about everyone in our group traveled with either Tevas or Chacos. That’s because there will be many times when you may be walking in water or will have a wet landing on an island. For these times you’ll want something sturdier than a flip-flop, but you obviously won’t want to get your tennis shoes wet. Sturdy sandals are perfect for this. I travel everywhere with a Buff because it pulls my hair back when it looks like crap, keeps the sweat out of my face, and also protects from the sun. 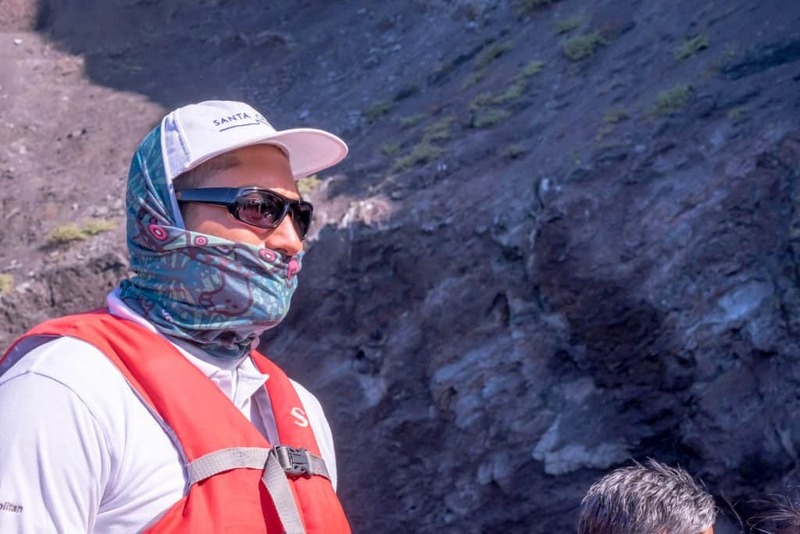 Even the local guides were wearing their buff to protect their faces. You’re heading to a seriously hard place to get to in the world. Don’t leave home without a camera to capture some of your memories. A good travel camera is essential. We traveled with a Fuji X Series camera with a 50-200 mm lens. Along with a Canon 5D and 600mm lens so that we could get some up close shots of the wildlife. If underwater photography is of interest to you I would suggest purchasing the Sony RX100v. We just got this camera with underwater housing and can’t recommend it enough – small, lightweight, and great image quality! I think we were the only people in our group without binoculars and it was a major bummer. Binoculars offer you the chance to view wildlife much better than your bare eye – and you’ll be seeing lots of wildlife. 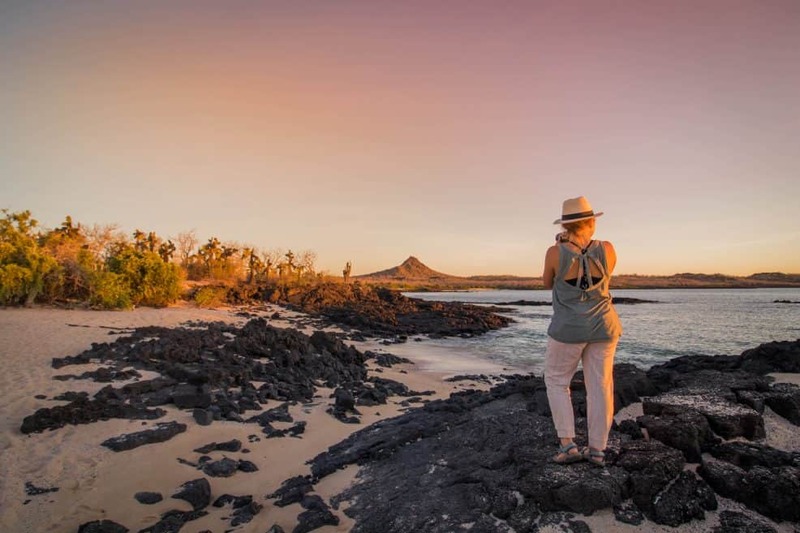 There are options that aren’t too expensive online, and if I could redo my Galapagos packing list I definitely would have purchased a pair to have on this trip. If you’re cruising around the islands and get sick sea easily make sure to pack Dramamine in your medicine kit. Our ship, the Santa Cruz, had a doctor on board and extra Dramamine but you can’t guarantee that yours will. It gets really hot around the Galapagos and the sun is baking on you so your skin is bound to take a hit and get dry. Bring some kind of lotion (I like cocoa butter) to keep your skin hydrated. I thought that our ship would have lotion and be well stocked with amenities like in a typical hotel room, but it wasn’t so I was happy I had back up lotion in my bag. Hot sun + dry climate = chapped lips. Bring some Vaseline or chapstick. You’re cruising around one of the most biodiverse areas of our planet. Please do not buy plastic water bottles and contribute to the worlds pollution problem. Buy a travel water bottle before your trip and keep refilling it up with that. We personally didn’t bring walking poles but saw many older people venturing around the islands with them. If you are used to walking or trekking with poles than I would suggest putting them on your Galapagos packing list. These aren’t necessary, but I personally love longer socks when I’m hiking around areas with lots of grass and bugs. We both travel with a Fitbit just to see how much we are walking each day and to monitor our heart rate, it truly helps us stay in shape while traveling not just in the Galapagos, but everywhere. 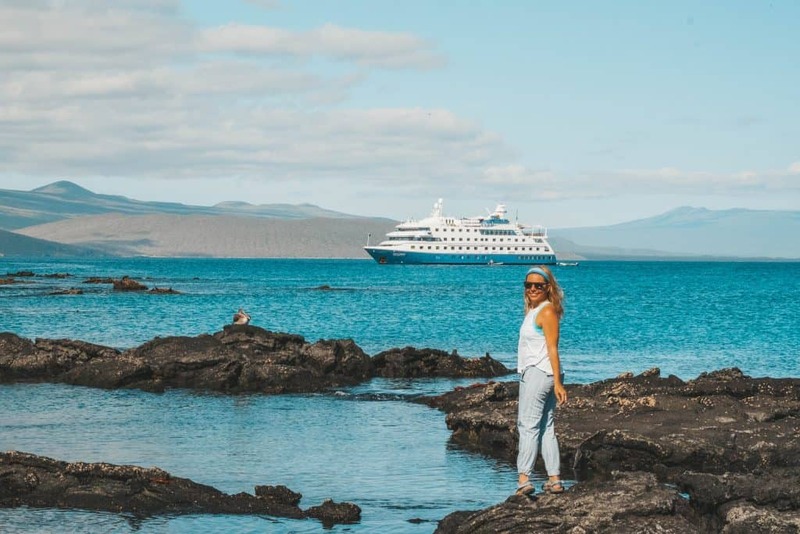 You won’t have a TV or WiFi cruising around the Galapagos. Bring a book or Kindle with you to keep you occupied at night. Keep in mind that if you on board a ship like we were staterooms will be small and transfers will be on a dinghy. It’s best not to bring big suitcases. Your accommodation provider may provide biodegradable toiletries, but it’s good to keep in mind to adjust your products for the environment your in. The Galapagos are very precious and anything put on your body and then in the water goes into the ecosystem. All bags are run through customs when you leave Quito or Guayaquil and again when you arrive in the Galapagos. Do not bring any fresh fruit or things that will set off the alarm. Guide Book: You may not have internet to do research in the Galapagos. For wireless nights we typically turn to Lonely Planet.